Late 1800s hatbox. It is oval in shape, made of a rich brown painted metal. There is a small handle on the top, attached at four spots. It also has a hasp for a lock on the front. The lid itself is hinged. There are extruding and indented rings for decoration. The underlying metal, and the inside, are black. Hatboxes of this sort (i.e., sturdy, metal hatboxes) seem to have been used often by emigrants. 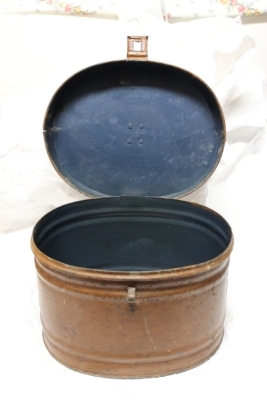 The original owner of this hatbox, Sariah Holmes Brown, immigrated to Utah in 1874 at the age of 14. It is possible she (and/or her mother) used this in the move.